Guest Post » Classic Spotlight: Unsung Heroes. The Guy In the Rubber Suit! Having tolerated and endured the outer fringes of yet another strain of flu swirling around the outskirts of Northern Virginia. I’ve accumulated coup and time seeking diversions. Mostly on line, though reserving evenings to indulge in a treasured pastime of my youth. Taking notes and seeking details in the quest for answers. And amusement. While satisfying an itch that has been seeking release. As a child of The Cold War and the 1960s. Long before modern cable, satellite and on line menus of fare.one of the pleasures looked forward to was local weeknight Prime Time. Where smaller, independent stations would fill their air time with films. Usually devoting one night of the week to a specific genre. Or actor. And in this arena, I was mightily spoiled. With one station devoting Thursday nights to Horror and Science Fiction. Where I developed a fascination with “Red” and “Atomic Scare” films of the 1950s and early 1960s. And an ever deeper appreciation for those actors and technicians who brought scaly, sometimes “Bug Eyed Monsters” to frightening life. Unsung Heroes: The Guy In The Rubber Suit! Focusing my attention on small handful of offerings. Though these managed to make huge impressions at first viewing. And supplied a unique classroom to study details, lighting and nuance through countless years. My first selection is a Classic. To no one’s grat surprise. Though one fully worthy of close and meticulous inspection and tribute. You all know the tale. Or should. The testing of US nuclear weapons on and blow the Pacific Ocean and close to the island of Japan has caused some odd events to unfold. Large fog banks.Unexplained shifts in tides. Larger and more disastrous accidents at sea. Enough for world-wide and renown Investigative Reporter, Steve Martin (Erudite Raymond Burr. Who also narrates) to book a flight to Tokyo and unravel these oddities. Once settled in, Steve travels to Odo Island. Acquires a colleague and counterpart from the Security Forces, Tomo Iwanaga (Frank Iwanaga). And the pair talk to the survivors of the sinking of a small family fishing boat and a commercial trawler. Then to the island’s inhabitants. 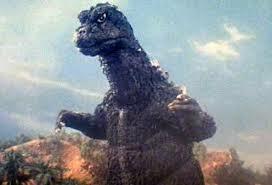 Who believe a sea monster god, “Godzilla” is the cause of all the trouble. Giant radioactive footprint of what could be a Trilobyte are found on the beach by a scientific team. Led by Steve’s friend, Dr. Yamane (Takasi Yamura). An alarm sounds. Everyone scatters. Climbing a tall hill. Only to catch sight of Godzilla from the neck up on the hill’s far side. I’m going to end it right here. Avoid Spoilers. While treading lightly on some intriguing revelations. Considered by most of a generation to occupy the top-tier of Giant Monster Movies. 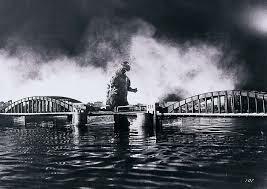 The film works so well, for taking one of a slew of original Japanese films, Gojira. A giant hit in Japan made two years earlier. Whose International Rights were purchased for $25,000. And then sold the film to a small production company, Jewell. With the backing of additional funding from Hollywood mogul, Sam Levine. With the aid of Toho Studios in Japan. Who edited like crazy. Removed more than sixteen minutes from the original. Added Raymond Burr for a string of scenes over a long week. And created a Classic! Not for the acting of the front line members of the cast. Which is pedestrian at best. But for the tricks and model work performed by Toho Studios. Creating multiple balsa wood, rice paper and papier-mâché sets of differing perspective and sizes to depict the destruction of down town Tokyo and surrounding cities and burghs. Then employing not one, but three different sized, uncredited actors (Katsumi Tezuka, Ryusaku Takasugi and Haruo Nakajima) to climb inside three different sized rubber suits. To successfully suspend disbelief, at least for this then eight year old kid. While savaging annoying rush hour commuter trains. Knocking down spider web power grid towers. Deflecting tank and small arms fire. Being annoyed at rockets from gnat-like F-86 fighter jets. Responding with radioactive Halitosis. And scarily kicking the crap out of anything and every thing in his path. A marvel of grainy, documentary-like B&W cinematography by Masao Tamai. Who knows the value of shadow and fog to heighten mystery, tension and dread. Aided by masterful editing by Terry O. Morse. Trademark model and effects works from the then fledgling Toho technicians. And its Sound Department wizard, Hishashi Shimonaga. For finding just the right implements to play with in an empty toilet flush box to create that unique “Godzilla Roar”! But it is the guy(s) in the rubber suits that make Godzilla, Godzilla. Scaly skin, rarely blinking eyes and all. Adding that extra something that grabs your attention in this first offering. And makes you care about the creature’s plight in several films afterwards. Which has been nowhere to be seen or experienced in any of the more modern CGI offerings today! My next offering comes from the heyday of low to medium budgeted, B&W. “Red Scare” and “Evil Space Monster” Sci~Fi films. The 1950’s. Mid 20th century. 1958. to be specific. With a not really new plot line that would return numerous times in television series, like The Outer Limits. Though this offering set the bar rather high for its well-edited tautness. And its fluid and surprisingly straight story line. Courtesy of MGM Studios. It is early 1973. The US has sent the first nuclear powered spaceship. Challenge 141 to orbit and set land on and explore Mars. The ship, under the command of Colonel Ed Carruthers (Marshall Thompson) comes down six moths later in he middle of a solar dust storm. Lands badly. And won’t be able to return home. The crew is not harmed. Tele Radio communications are out. The U.S, Base Command assumes the worst. A rescue mission, Challenge 142 is assembled and sent on its way. While the crew of C-141 begins its exploration.Unaware that some thing is out there. Singularly at first. Then in large numbers later. The crew disappears. Until only Col. Carruthers is left. Deep into siege mode in the sealed upper levels of C-141, Awaiting rescue and surviving on the collected rations of the missing, presumed dead nine crew members. Challenge 142 arrives in June. Under the command of Colonel Van Heusen (Kim Spalding). Who has orders to cut exploration to a minimum. And return with Carruthers. Who is to be face Court Martial and possible murder charges. It seems that none of the ten-member crew believes the ill-fated, restricted to quarters, Colonel. As what remains of the corpses of the previous mission are stowed away for autopsy. C 142 prepares to lift off. And a large exhaust vent reporting “Open” is closed. The ship leaves. Mars’ gravitational pull and the humdrum of shipboard life returns. Dr. Mary Royce (Ann Doran) examines the skull of Cartwright and finds what looks like a .45 caliber hole above the temple, but no bullet. Causing Col. Van Heusen to comment within earshot of Carruthers that “only one kind of monster uses bullets.”. Deflating Carruthers’ belief in a hostile alien only minimally. Until a crew member, Joe Keinholtz (Thom Carney) reading dials at his work station on a lower level. Hears “The obligatory Mysterious Noise” and investigates. Cautiously going down the aluminum stairs. Calling out. Interspersed opposite quick glimpses of shadow led dark, large and long, three-clawed, scaly hands and feet (Scarily. other worldly, tricked out. Veteran Stunt Man, Ray “Crash” Corrigan) shuffle though light slashed, crowded darkness. Keinholtz continues his quest to the level where his quarters reside. Opens its door. Steps inside. And screams as its door closes! Carruthers thinks he hears a noise and goes off on his own. Breaking up a Chess game. Followed by Dr, Royce (Dabbs Greer), Col. Van Heusen, Major John Perdue, (Robert Bice) and the Fenelli brothers, Gino and Bob (Richard Hervey and Richard Benedict) Moving downward as the others are awaken and a search begins. Interspersed with quick glimpses of shadow led dark, large and long, three-clawed, scaly hands and feet shuffle though light slashed, crowded darkness! The search is fruitless. And the crew heads upward. Except Gino Fenelli. Who turns his back, opens his locker and becomes “It!’s” second victim. Ground and corners are covered again. As Carrruthers leaved again a grated air duct. And a bloody arm drops down. It’s Keinholtz! Curled and crumpled. Dead and ghastly pale. A second air duct is investigated by Perdue. He finds a near dead Gino Fenelli and tries to drag him out. As “It!” sees a newer, fresher meal. Gunshots ring out and Perdue retreats. Against the wishes of older brother, Bob. Grenades are found and strung to grates in Booby Trap manner. Discussions move away from Carruther’s possible guilt and plans are made to find ways of containing, fighting and killing the alien stowaway. While moving as many supplies a possible upstairs. Food, water, EVA suits and all sorts of weaponry and ammunition are gathered. Intercom systems are turned and left on as a retreat is made to the ship’s uppermost level. Gas bombs and bullets have little effect as a strategy is sought. As scavenging forays below raise the body count. Lower sealed and domed hatches are broken through as “It!” expands its domain. A plan to go outside the ship. Get beneath the creature. Open the ship’s atomic core and fry it doesn’t deliver the desired results. And leaves Perdue pinned against a bulkhead. His faceplate and suit slashed. Keeping “It!” at bay with an Acetylene torch. A rescue mission is quickly cobbled together as Mary Royce (Ann Doran) notices gauges showing much higher than usual Oxygen use…..
I’ll leave it right here for Spoilers sake! For its time. Still one of the best “Bang For The Buck!” Science Fiction films available. From a Screenplay by Jerome Bixby and Directed by Edward L. Cahn. Backed up excellent, shadowy and cramped cinematography by Kenneth Peach. With any fat trimmed away by Editor, Grant Whytrock. Having the film clock in at a trim sixty nine minutes. Ethereal, occasionally brass heavy music by Jack Cookerly. And unique, often scary sounds from Robert C. Carlisle and Al Overton. 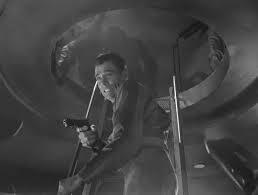 Set Direction by Mr. Bixby and Arthur Wasson enriches tension and claustrophobia. Aided by Set Dressing by Herman L. Schoebrun. Putting together a superbly executed thumb nail sketch and precursor. That would be expanded upon by Ridley Scott’s Alien just two decades later! A geology expedition along the Amazon unearths the fairly well-preserved skeletal remains of a larger than human sized skeleton. With what appear to be webbed fingers and toes. The expedition’s leader, Dr. Carl Maia (Antonio Moreno) returns to the US and visits his friend, Dr.David Reed (Solidly reliable Richard Carlson). An Ichthyologist and guest of Dr. Maia’s Marine Biology Institute. Intrigued, Reed talks to his boss, Dr. Mark Williams (Richard Denning) to fund a larger, more intensive return expedition. A tramp steamer captained by Lucas (Nestor Pava) is acquired. Loaded with dining and scientific gear. Along with Reed’s girlfriend, Kay Lawrence (Julie Adams). And Dr. Edwin Thompson (Also reliable Whit Bissell). The ship arrives back at the dig and excavation site, but no one alive is around. All killed messily. And in ways that don’t align with Dr. Maia’s belief that a Jaguar is to blame. Work is accomplished, but to no avail. Reed and company are about to pack it in and write everything off. When Lucas suggests that the present site may be part of something lager and drifted with the currents through the years. And going up river may bare better fruit. A lagoon. A “Black Lagoon”. Untouched by time, man and God alike. Pristine and idyllic in the extreme. While also hiding an undertone of “Scary as Hell!”. For, as local legend has it. Whoever enters. Does not return! But, what’s local legend stacked up against intrepid Science?… The ship’s anchor is reeled in.And the Rita cuts against the current, following the jungle canopied river to its tributary, The lagoon. Where anchor is dropped. Diving tanks, masks and fins are donned. Lights checked and plans reviewed before Reed and Williams go over the side to grid a location and collect whatever may be of interest. Unaware that the Creature, or legendary “Gill Man” is hip to these uninvited guests. And has been watching them above and below the sea since their arrival. And is particularly interested in the female of the species. The “Gill Man (Ricou Browning) gets his chance as the guys examine their booty. And Kay goes for a swim. Oblivious that she has a silent, elusive suitor and stalker. Who gets temptingly close a few times. Before getting tangled in the ship’s limp trawl. Escaping, but leaving a claw behind! Despite their best efforts. Crew members of the Rita begin to disappear. A trap is set. The “Gill Man” captured and kept in a cage. Waiting for the right moment. Which happens as Dr. Thompson draws guard duty. The “Gill Man” breaks free and attacks. Kay tosses a kerosene lantern before the “Gill Man” can kill the doctor. Dives over the side and escapes. David suggests that it’s time to pull up stakes. The ship fires up its boiler and turns with the current. Only to discover that fallen trees and logs have dammed the lagoon. Whoever is left. Minus Dr. Williams, who decides to take their nemesis on, one on one, underwater. Start pushing, pulling and shifting the obstructions out of the way. As Mark is slashed up pretty badly. 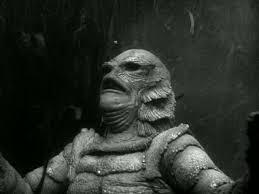 And the “Gill Man” claims Kay as his reward!…. I’ll not violate the Prime Directive regarding Spoilers. And leave it right here! This film, like Tod Browning’s Frankenstein, didn’t scare me all that much as a kid. Though I have come to deeply admire and appreciate the clever craftsmanship and sleight of hand that is part and parcel of this better than “B-Movie” fare. Yes, the film is full of standard bearers of that genre. And all perform admirably with what’s at hand. It’s the little things that means so much. And pushes the whole beyond its grasp. A relatively short, taut and frill-free film that comes in at 79 minutes. With several Florida and California locations filling in for deepest, darkest Brazil. 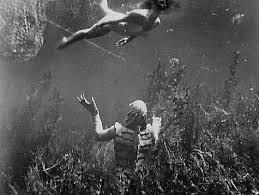 Especially Wakulla Springs, Florida for its un murky and crisp underwater scenes. Plus having two actors and two suits of different shades. A darker suit for Ben Chapman. Out of water. And a lighter in color and weight suit for Ricou Browning. Who had to hold his breath underwater for four minutes or more for certain scenes. Thus negating the need for air tanks or re-breather units used in later franchised films. Film editing by Ted J. Kent is on the lean side. With no scene running longer than it should. Often heightening tension with tracts from Music director, Joseph Gershenson, Milt Rosen. And uncredited Herman Stein and Henry Mancini. But it is the “Monster” that pulls the plow in this film. Both internally and externally. And highest praise goes to fashion designer, bon vivant and incredibly talented formidable woman, Millicent Patrick for designing such a unique, believable and iconic creature! Which deals with Lt. Shin Hayata (Susumu Kurobe). A member of Japan’s Science Patrol. Who had unofficially dies in an aircraft accident involving a UFO. And was given various super powers afterwards. To grow in size and strength to protect the Earth from demons, monsters and aliens forces too numerous to mention here. With strength and power delivered by the sun. And on a strict time clock once becoming Ultraman. Noted by a color changing amulet on his chest. 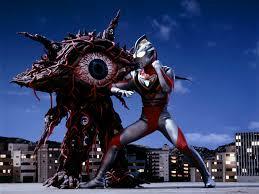 Ultraman takes on all (Guys in Rubber Suit) comers. Battling until the final countdown. Before flying away towards the Sun to turn and deliver the Coup De Grace! Not exactly a complete Chinese ripoff of Ultraman. Courtesy of Trans-Pacific entrepreneurs, Shaw Brothers. But close enough for government work. The year is 2015. And Princess Dragon Mom (Terry Liu), the prototype of every later scantily clad, Power Ranger protagonist has been released from Outer Earth to wreak havoc upon several cities in China. To gather attention and establish her ability to strike fear and terrorize. Returning to Inner Earth. She gathers up a Rogues Galley of assorted monsters and demons. Skeleton Ghosts, expendable cannon fodder from the Glacier Empire. In black and white skeleton suits with explosive spears. Witch Eye. Princess Dragon Mom’s beautiful assistant. With eyes her palms that shoot hypnotic rays. Driller Beasts. 1950s looking robots with Drill Bit hands. A giant Asparagus looking creature by the name of “The Mutant Octopus”. Robot Monsters with “Slinky” Spring Loaded Maces for fists.The Iron Fist Monsters. And a Red and Black Beetle Monster. Rayma (Danny Lee), an assistant to the Professor (Hishe Wang) is asked to undergo an experiment. Which will turn him into ultra bionic Super Infra-Man. With “Thunderbolt Fists” to take on Princess Dragon Mom and her minions of evil! The metamorphosis isn’t exactly animated. Nor is it live action, but it fun to watch. Allowing our hero to “Chop-Socky” and acrobatically kick in the backsides of the evil monsters. Singularly at first. And later en masse as Princess Dragon Mom raises the stakes. And kidnaps the Professor’s daughter, Mei Mei (Yuen Man Chi) for a final showdown! For the connoisseur of badly dubbed Martial Arts and cheap and cheesy Special Effects flicks. This one is pretty hard to beat. English Dialogue Peter Fernandez, Kuang Ni and William Ross could be less vague, but that’s part of the fun. Cinematography by Tadashi Nishimoto keeps the action in the frame. Special Effects are on the cheesy side. Though it is the cadre of uncredited Costume Designers who go all out in the Rubber and Metal Suits department. Conceptualizing, assembling and creating some the coolest looking, functioning and sometimes laughably unique monsters since another Guilty Pleasure, Flesh Gordon a year earlier! All of my selections, either film or episodic television are available on You Tube. Agree? Disagree? Personal Favorites or Suggestions? The Floor Is Open! And thanks for such a great comment and start of the discussion! ‘Doctor Who’ is another great “Guy In The Rubber Suit’ series. Though, I was always taken aback by so many alien species being able to speak “The Queen’s English” so well! Also pleased that the earlier series were less Special Effects laden. And that you could escape Daleks by climbing up a flight of stairs. Always thought Davros was a superb execution of appliances, creepy make-up and prosthetics. Completely in character with the mot evil creature in the universe. Thankfully, ‘Godzilla’ was of a time before “Method” acting. Though, the simple answer would be. “You’re angry about being re awakened . 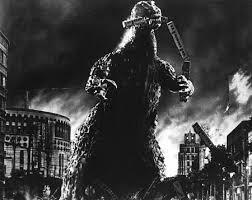 And you want to destroy Down Town Tokyo!” Which became a recurring theme through many films. What a great article! This really speaks to me; man I love creature features, especially the Godzilla movies. I’ve seen most of them and they are great! 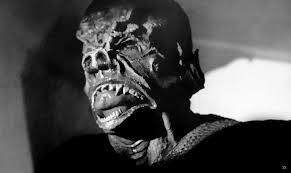 “Creature Features” are kind of, more of a “Guy Thing”. And I wanted to get it as right as I could. I’ve been wanting to do a tribute to the unknown, but essential actors and designers of favored childhood and teen films for more than a year. Just needed the time and the extra choices beyond ‘Godzilla’. Who started losing his mojo after fighting “Hidorah, The Smog Monster”. And inheriting a cute little baby Godzy to teach and look after. 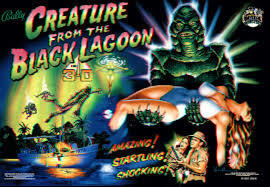 “It!” and “The Creature From The Black Lagoon’ were naturals. 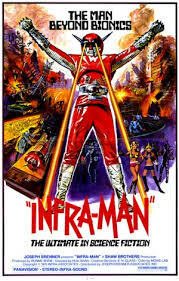 Then, I got the idea of expanding into television and that Guiltiest of Pleasures, “Super Infra-Man”. Which has to be seen to believed! Yeah, Kevin once again nailed it. Thanks, Mark. Way to go, Kevin. This brought back a bunch of memories watching Saturday TV. 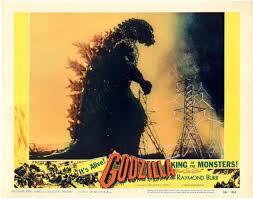 I remember fondly watching Godzilla, with Raymond Burr. And certainly the Creature From The Black Lagoon totally creeped me out. Another wonderful contribution, my friend.